Looks like I'll be going to maplins very very soon. I'll get the board posted out to you tomorrow Dave. Do you know what you need to solder onto it? Nope you didn't want one, you wanted one of these. See here. The above is what you'll be getting. This is what you need to add to it: The component list is here. Have a good read through of that page, especially the pictures at the bottom that show the board before/after construction. Soldering will be necessary, I'll hang on to the board until your 100% sure you can do it! Hi Dave, I posted your board to you today As for headers, try these they're quite expensive, maybe you can find cheaper ones? You just need 2 strips of 15. I usually get 4 x 8pin ones as they're more common. Are you going to implement the extra external lights? 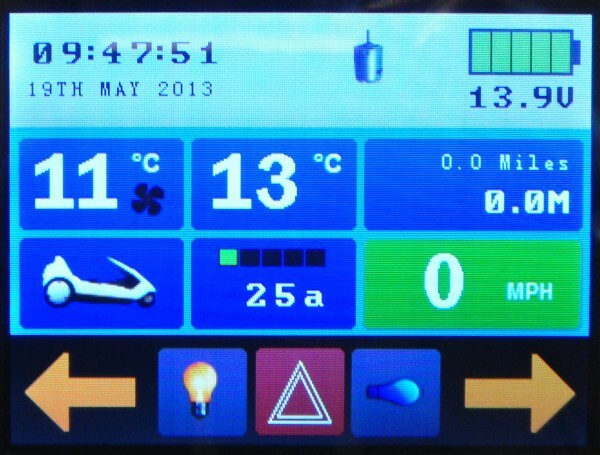 I have a set of Blue LED strip lights under the C5 that the middle button on the display controls. If so, you'll need to double-up on the header pins for the Arduino as it gets in the way of the Mosfet (I didn't take into account the overhang of the Nano's USB socket when designing the PCB). If you're not going to use external lights, you don't need to put anything in TR5, R8 and OUT4. For the RTC, try this one. I'm impressed you've got most of the stuff, you'll have to keep a record of how much its cost you. Also, post some pics of you're progress in a new thread so I can see how you're getting on and spot any errors! 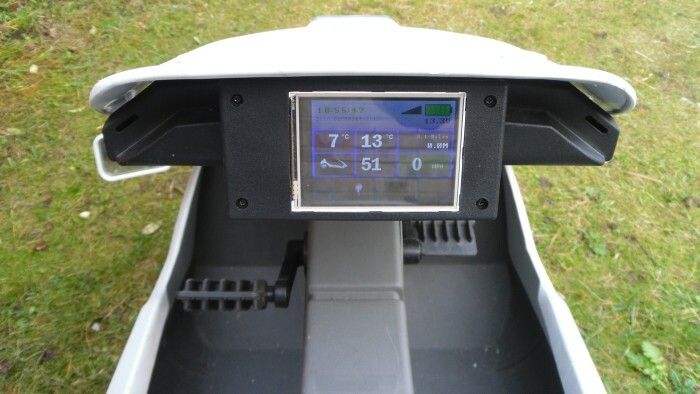 What I didn't explain on the project page was what lights etc go where: BATT = Battery SWI = Handlebar switch INDICATORS = Guess?? Left switch/Common/Right switch OUT1 = Left Indicator lights OUT2 = Right Indicator lights OUT3 = Front/Back Lights FAN = Motor cooling fan (Optional) OUT4 = External lights (Optional) RELAY = Motor Relay T-INT = Ambient temp (LM35) T-EXT = Motor temp (LM35 strapped to the motor) CURR = Current sensing module RD1 = Main reed switch (Back wheel) RD2 = Unused reed switch RTC = Real Time Clock module What size project box have you got to put it all in? Dan on the comp link to ebay it comes up with header pins ? are the headers for the clock the same as the nano ? Yes, a row of 4 need to be soldered to the board. The RTC should come with male headers already soldered on. Yep they're the headers you need. Have you got a link to the blue strip lights ? Hi Dan, I would like to test too! What will I need? This is the box I have: I've bolted the Relay onto the side of the box and the Current module is also bolted to the right side. The board just sits on the bottom, its not held in place, when all the wires are plugged into it can't move around. 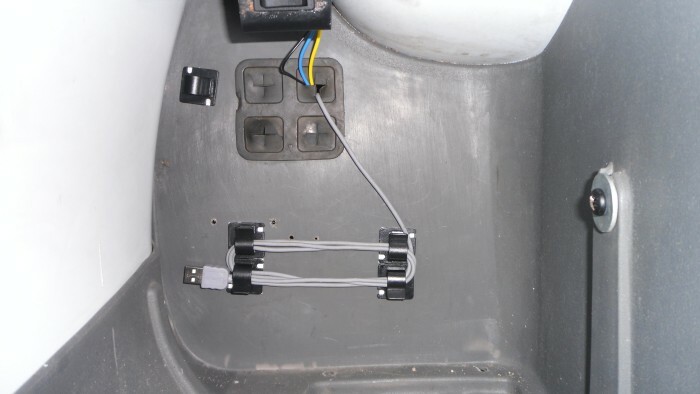 To make it easy to apply software updates I leave the USB cable in the Nano and run it through the back with the indicator switch wires and store it under the seat. whats the box on the back of the seat? 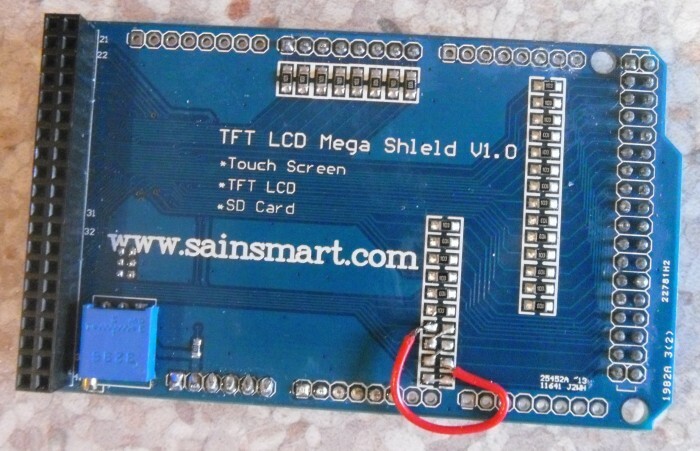 what can you use if you have not got a small pcb with pins on for the screen end ? dan do you want the evtra bits that are left over ? dont think ill need them ? 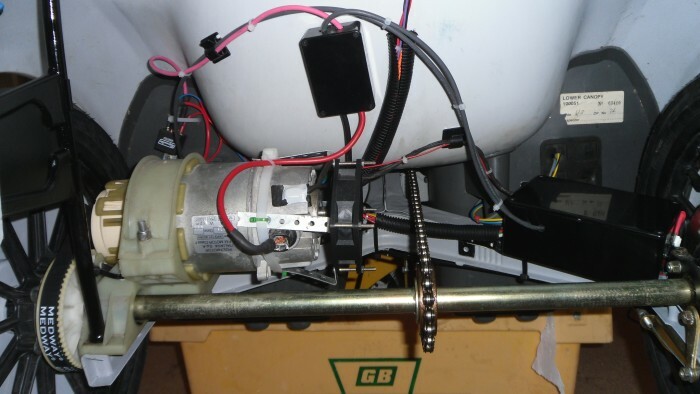 That's just a terminal block connecting the motor cables to the ones from the battery (+12V) & control box (GND) with a 1N5404 diode to stop back EMF damaging the relay[omg]. You'll need to add a diode to your setup too. Do you have a 4-way connector? You could just solder wires onto each pin at the bottom and solder them on to the Arduino pins. Have you got the cable that joins front to back? I used this alarm cable as its got a shield built in. You could solder the cable wires directly to the Arduino, though this makes it difficult if you want to remove the screen for any reason. I could solder the pins then cut the wires at the back of the box and put a male and female plug on ? Cool, you could start some of the soldering soon then?? This is a picture from the top of the MEGA board if that's of any use. And one from the back, you should be able to see whats going on. This is the arduino I used on my early prototype screen which is why there's lots of angled header pins on there. All you need is TX1, RX1 (top-left) and the power connector (VIN & GND bottom-right). So u go for the bottom end then ? it would be better using usb ? Dan have you got a link to a suitable handle bar switch or a trottle if you can use 1 ? Its on my wishlist, at the moment you need to use the TX/RX pins instead. 24v good man you will never go back to 12 v a good kit to get uni 8 and no handle bar switch what's your next project 24v touch ? Erm, you can do. It just makes it harder later on if you need to remove the board later on. That's why I put the connectors on everything. Its entirely up to you, I suppose it also depends on how you lay out your project box. 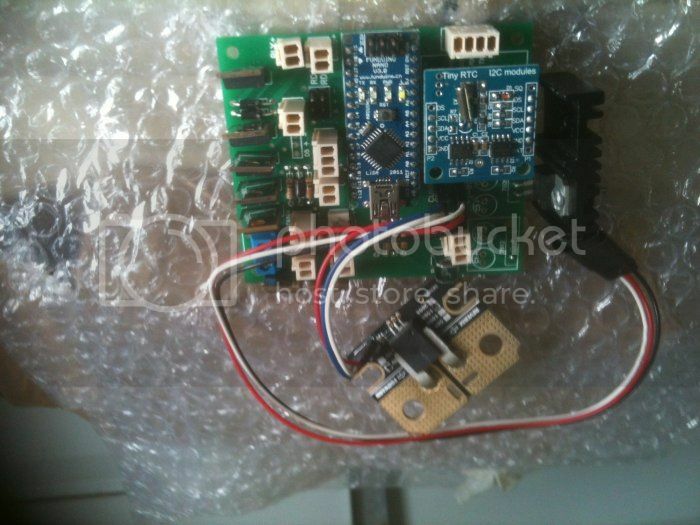 what's your next project 24v touch ? Yep, I want to get one running on 24V and then look at sticking a touchscreen on it. Cheers was going to put a 4 pin plug outside of the box so I can take the screen off if needed can you do a.wiring diagram or is that another topic ? Nicely done Dave . You're not far off then. I gave mine a test on Mon, with the C5 sat on a crate and had the motor on for ages and the Arduino nano got a bit too hot for my liking So I'm thinking of strapping a heatsink to its regulator or maybe add a separate 12v regulator to the pcb somewhere to keep the voltage within the acceptable range for a Nano. What can I get on with now ? Can you not just put a small fan in the control box ? What can I get on with now ? 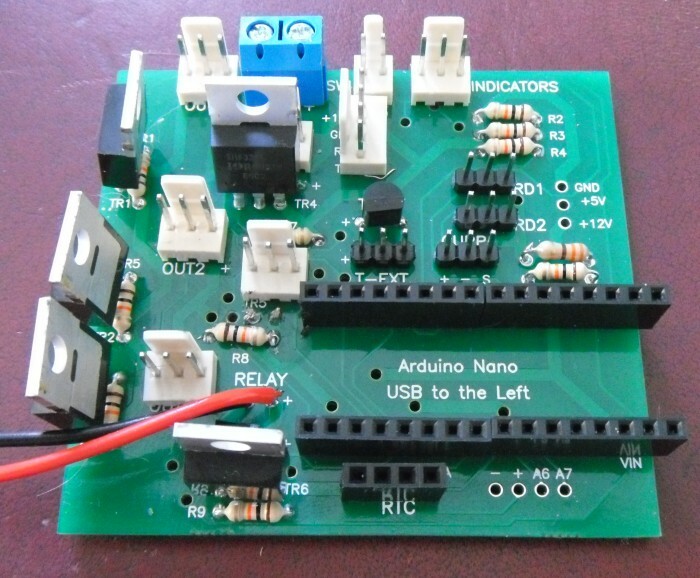 Have you got the rtc/current module? Where's your project box? 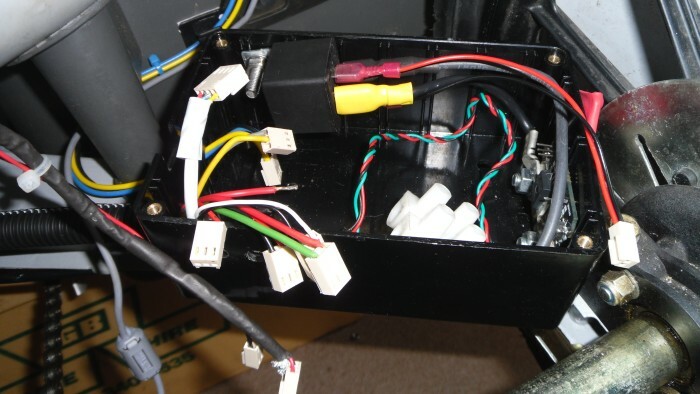 Are you going to be using one of the power wiring kits from Chas? Can you not just put a small fan in the control box ? Could do, the battery I used with my original setup gave off about 12.5v, but the car battery I stuck on it over the weekend did nearly 14v and as the recommended limit on the Nano/Mega is 12V I think a small heatsink or regulator is the best way to go. I'll knock something together in the next few days to see what works best. I may end up cutting the 12v track on the pcb to the Nano/mega and feeding 9v (using a L7809) to them instead so its well within the limits. Project boxs in the bag ftc on way from hong kong cur sen on way from usa I'll use one of chas wiring kits anything else I have to get ? Where do I download the software for the nano ? Do the pins need cutting on top like the pod module ? The software will be coming give me a couple of days for that. No, you don't need to trim the pins off, unless there may be issues with headroom in your project box. 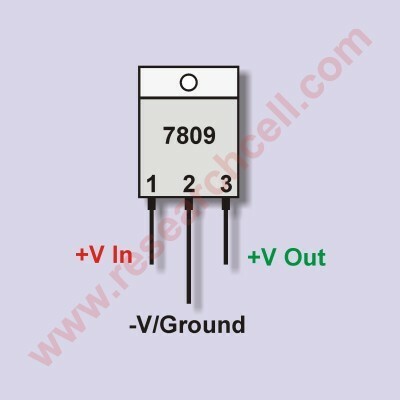 You could test each mosfet if you've got a 12V led/light that you can add a connector to, if you know a bit of simple programming? What do you mean the back of the screen end, the wiring? As for the temp, it's too hot for my liking (esp. the Mega) so, like I said, I've fitted a L7809 regulator on the main PCB to drop the input voltage down to 9V. I made use of the empty holes for GND & +12V on the right of the board and soldered the regulator into there and bent the OUT leg over the PCB (parallel to RD1) and ran a wire from it to VIN on the Nano. I cut the track under the board going to VIN on the Nano and fed a wire from the VIN pin connector to OUT on the regulator: You could probably get away with a smaller heatsink but this is the only one I had hanging around. If the board was bare I'd also cut the track at the 12V pin for the serial cable so the mega would have 9V as well but with it fully assembled its pretty hard to cut it unless you remove the surrounding connectors. If I ever got the board re-done to work with 24V I'll add in room for a separate regulator and move the Nano further away from the connectors. Next job is to find a heatsink to attach to the Mega! Do I need to get a l7809 ? On ebay they look like mosfets ?also I've noticed 4 header pins in the rtc and the 4 at the side do they need doing ? Do I need to get a l7809 ? On ebay they look like mosfets ? If you're sending the board to me, don't worry about it. I've got a few spare, I'll solder it on. I've noticed 4 header pins in the rtc and the 4 at the side do they need doing ? Yep, make sure you do the right pins, GND,VCC,SDA,SCL. If there's a DS hole, ignore that. Done the last mosfet also put the 4 pins right of the rtc and raised the rtc headers didn't look enough room to put wires on with my fat fingers wrapped it up well send it to you in the morning to see if it ok ? I think they're too big, I'll make you one up that you can just glue to the top of the regulator the same as this guy has done here. So I have to do this to mine ? Nope, yours is fine without it. I just wanted to show what needs to be done to be able to use an SD card with this screen . Hi Dave, Received it today, I'll try to have a look at it tonight or tomorrow and get it back to you. Hi Ralph, Glad it got to you in one piece. 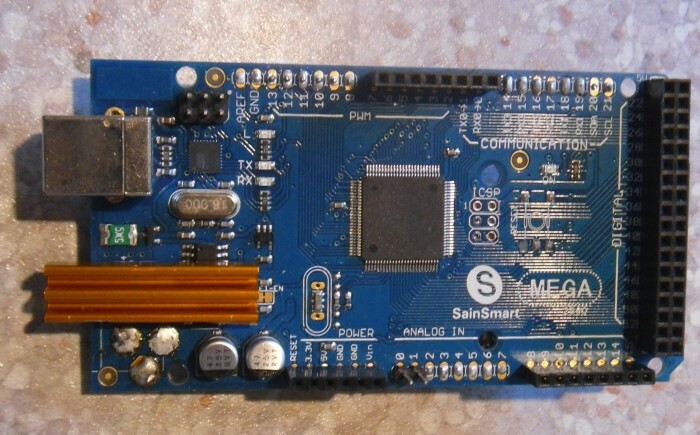 The main thing that you will need to do is ensure that the Arduino Mega (that you need to get) you will need to add on a decent sized heatsink as explained earlier in the post as it gets hot[omg]. glad it got there in one piece what wiring do i need to get ? 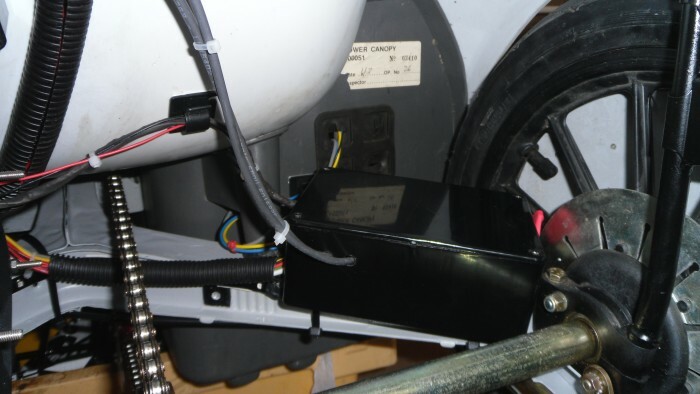 Wot conections plugs go on the header pins were do you put the current sensor and how do you connect the motor to the control box ? Ah right, they're not used. Don't worry about them! Do you bolt the screen to the back of control box ? sorry about that project box not control box or is there fitting kit ? Ah right. Nope there's no fitting kit. I just cut a square on the front large enough for the screen to sit in, drilled a hole at the back for the cable, another hole on the left for the USB, but that's optional. I drilled 2 holes in the back for bolts to go through to hold it to the POD case I used, but how you do yours is up to you. My project box was 130mm x 70mm x 45mm and at that size I needed to shave about 2mm of the LCD PCB off to fit. At 130mm wide it fits perfectly between the 2 indents on the front of the POD. So I need 2 of them leads and a long 1 for the lm35 strapped to the motor ? Yeah, get your self a bunch of these, they're always useful for arduino projects. I just got 3 bits of long wire (surrounded it with kitchen foil and heatshrink wrapped to prevent noise) or you could use some of that alarm cable if you have any left over? Then add a connector for the motor LM35. L7809 & heatsink & one for the mega - also for the nano? 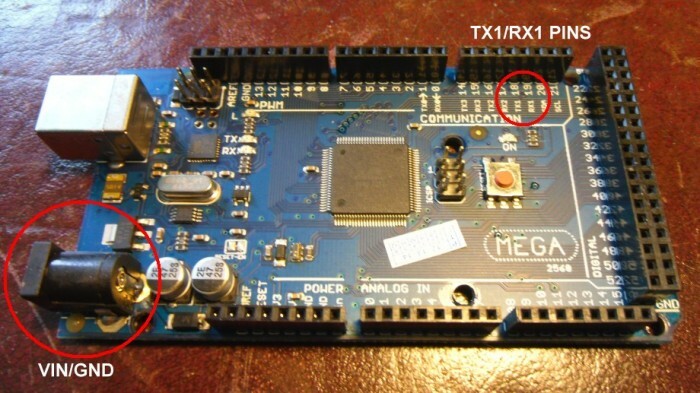 do you find a way to make use of the usb instead of soldering extra wires on the mega? I didn't no, I have just soldered wires onto the back of the mega. find a listing of: 1N5401 Peak Repetitive Reverse Voltage Working Peak Reverse Voltage DC Blocking Voltage 100 RMS Reverse Voltage 70 1N5404 Peak Repetitive Reverse Voltage Working Peak Reverse Voltage DC Blocking Voltage 400 RMS Reverse Voltage 280 so the 5401 is to "small"? the other Characteristics are the same, . . .
Yeah, you can use 1N5401, that is the same as can be found in the original control box. Dan what is the max watt can the aux lights handle ? Sorry but I do not have any more of the xpod boards left, the whole thing is extremely complicated and time consuming to build. If you're having problems with the POD/CB setup you'd be better off running your C5 directly from a relay and maybe add a battery monitor to show you voltage/current/temp. is this allready out of beta testing? If so, where can i buy one? Hi, Sorry its no longer available. If anyone has a problem with a POD on their C5 its best to remove it all together and run it directly from a relay and perhaps add a car battery monitor as a display. In the netherlands you gotta have an pedalec mode to be legal. Any schematics available so i can print my own pcb and solder it? LOL, This is kind of how it was when I got it (volt meter anyway). 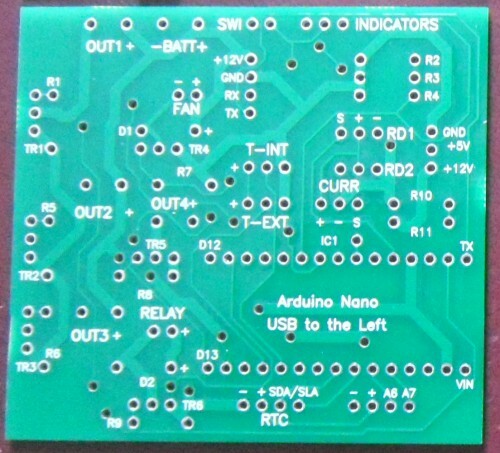 I am hoping someone might have one that someone can sell me a Pod, however I was hoping you might of been willing to share your PCB circuit schematic for the c5duino. Would try and make one of my own, probably with strip board!